Place all the berries (cut the strawberries into pieces if they are too large) in a large bowl and sprinkle with the sugar. Stir to combine and leave to macerate for about 30 minutes. In bowl of your electric mixer (or with a hand mixer or wire whisk) beat the mascarpone, heavy whipping cream, confectioners' sugar and vanilla extract just until soft peaks form. Take four wine and layer the berries with the cream. Garnish with a sprig of fresh mint, if desired. 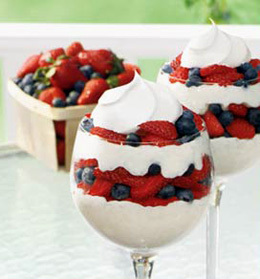 The parfaits can be made several hours before serving. Cover and store in the refrigerator.